It’s The Stories You Tell That Color Your Life! In a time when newscasters, friends and family tell stories that scare you . . . this book tells stories of understanding, healing and joy. This powerful little book is simple yet profound. 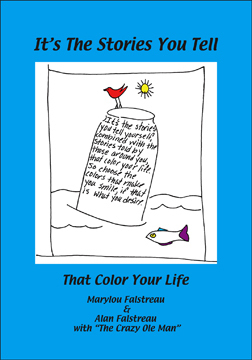 The drawings are whimsical and the messages are inspirational, clear and concise and easily accessible to those who are open to their truths. No More Labels . . . Experience The Essence of Life . . . This is one of my FAVORITE books, Alan…thank you and your wife for writing and illustrating it!! Thanks so much for the kind words Sharon, they are really appreciated. All the best to you and your family and friends this Holiday Season.